Vest-Agder is a region that is of particular interest to American people because a large scale emigration during the 1850s saw many people from this Norwegian region move to North America. Later on, when Norway became richer again, many of the emigrants returned to Norway – but just as many did not. 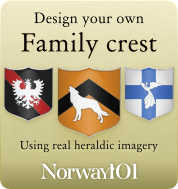 If you found Norwegian ancestors in your family tree, then the chance that they are connected to Vest-Agder is not that small. Before people of Vest-Agder emigrated to America (which coincided with the rise of the steam ships that were capable of crossing the ocean), there had been a bigger emigration movement a bit earlier: the Dutch had been trading with the people of the region since the early 17th century, and during the 18th century the Netherlands had a shortage of labor – so they talked many Norwegians into moving over to the Netherlands. 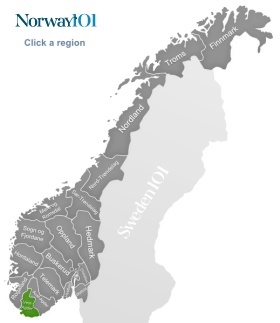 Apart from the emigration history, Vest-Agder also has a few other things that are interesting to know: it is the Southernmost region in Norway, and the region with the highest level of foreign exports. Kvinesdal is a municipality in Vest-Agder that still has strong connections to North America. Other Norwegians often call this municipality an “American village” because there is a high number of Americans present in Kvinesdal. The reason for this partially has to do with the fact that Kvinesdal was one of the municipality that lost many locals to North America from 1850 to 1950. Some of the people who left came back and took their children with them. The landscape of Kvinesdal is like a mini version of the whole of Norway, so you can basically see everything Norway has to offer in a quite compact region. For this reason, Kvinesdal is often also referred to as “Little Norway”. About ten percent of the locals in this municipality are American, and there are plenty of activities during the year to celebrate the connection. Farsund is the neighbour of Kvinesdal, and also still has strong ties to Northern America, but it is a smaller region than its neighbour, and mainly a region that can be used to explore the fjords. However, there are also some interesting churches to visit if you take the time: the medieval church called Vanse church can be found at Lista, and most likely is the oldest church in the region of Vest-Agder. The church could possibly date back to the year 1037, but people are still arguing about it. Further East, you can find the Spind church – a wooden church with 500 seats. It dates back to the year 1776 (no arguments about that one). If you would not only like to visit the oldest church (Vanse church) but also the youngest church in this municipality, then you need to head to the Herad church, as this was only built in 1957. Kristiansand is the capital of the region Vest-Agder, and the municipality of the same name is the sixth largest in Norway. The region around this city was inhabited for thousands of years. A recent find (1996) of a very well preserved female skeleton proved that people had been living there since at least 6,500 BC. Kristiansand is now home to some interesting building (though many really old building have been lost due to fires), and also to the largest shopping mall in Northern Europe: The Southern Norway Mall (in Norway better known as Sørlandssenteret). The zoo in Kristiansand counts as second most visited attraction in Norway. The zoo stands out from other zoos because all the animals are living in a natural environment, and seeing them can be very educational. Mandal is the second largest municipality in Vest-Agder, and a great place if you would like to see some nice beaches. The beaches are the main reason why Mandal is quite a popular place with tourists. There are many resorts, and during the summer months, the beaches can become quite popular. Sjøsanden, the beach in Mandal City, is often voted as one of the best beaches in Norway, and of course the easy accessibility is one of the factors that contribute to that. Of course, you can also find more than just beaches in Mandal: there are museums, some historic buildings, and plenty of art galleries (quite many excellent Norwegian artists came from this region). Søgne is another municipality that stretches along the coast, and a less touristy alternative to Mandal. Møvik Fortress was built by the Germans during World War II, and is an important and fascinating piece of Norwegian history. You can take a self-guided tour around this site, and also go into the museum, which is very recommend, because Møvik Fortress is the only place in the world where you can a 380mm Krupp canon.